Whether you’re looking for keepsakes to cherish your memories in paradise or fashion to reflect your island style, consider some of these unique products and gifts that are designed and crafted by Guam artists. Guam Unique Merchandise and Arts (GUMA) Gallery serves as a great starting point for anyone looking for local products produced with pride. Located at Chamorro Village, home of the Wednesday Night Market, GUMA’s mission is to provide a platform of support to Guam’s artists and designers, and its gallery is full of products crafted locally. A highlight from GUMA is artist Ron Castro’s three-dimensional puzzles. Depicting local icons like the coconut crab and the Plaza de España in Hagåtña, the wooden puzzles capture the uniqueness of Guam in fun fashion. Sirena Soul, another local business nurtured by GUMA, features ocean-inspired jewelry and apparel that calls to those who love sand between their toes, sun on their shoulders, and the sea in their hearts. Next door to GUMA is the Guam Art Boutique, a collaborative collection of work from 11 artists. These two stores have everything from soaps to bikinis; jewelry to cookies; greeting cards to coloring books, and everything in between. 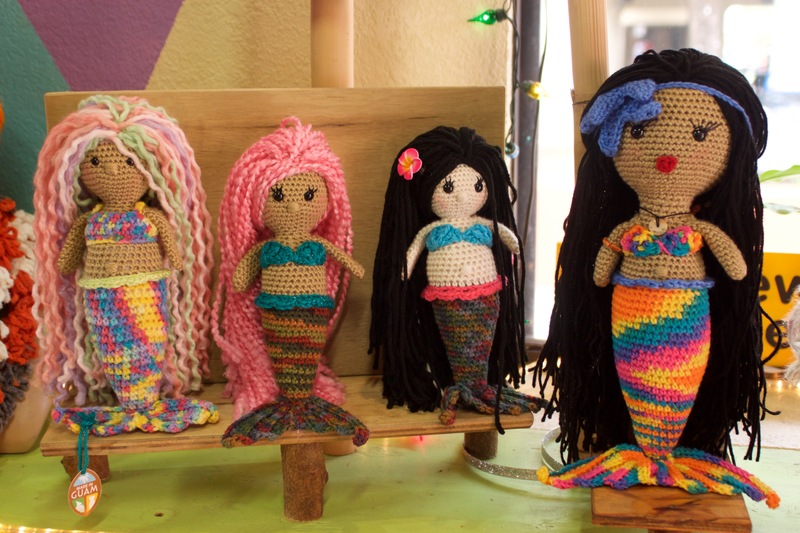 Also located at Chamorro Village is It’s Sew Jayne - a shop featuring handmade clothing and crafts including hats depicting popular TV and movie characters, crocheted dolls, and much more. Although most visitors attend the Wednesday Night Market, Chamorro Village is open daily and not just on Wednesday for the night market. Låguas & Gåni is a menswear brand created by a duo of Guam-bred designers. Incorporating distinct cultural elements such as the slingstone, pottery, and native trees of Guam, the vibrant fabric patterns of the Låguas & Gani collection weave a story of rich heritage and unique perspective. Browse their collection of tees, shirts, socks, neckties and bowties to add modern Guam flair to your wardrobe. The brand is available at T-Galleria in Tumon and online at http://laguasyangani.com/. T Galleria in Tumon is open 10AM~11PM every day.